As I happened to be near the Spa-Francorchamps circuit in Belgium last week I thought it would be a good idea to make sure I could visit some race event at the circuit. 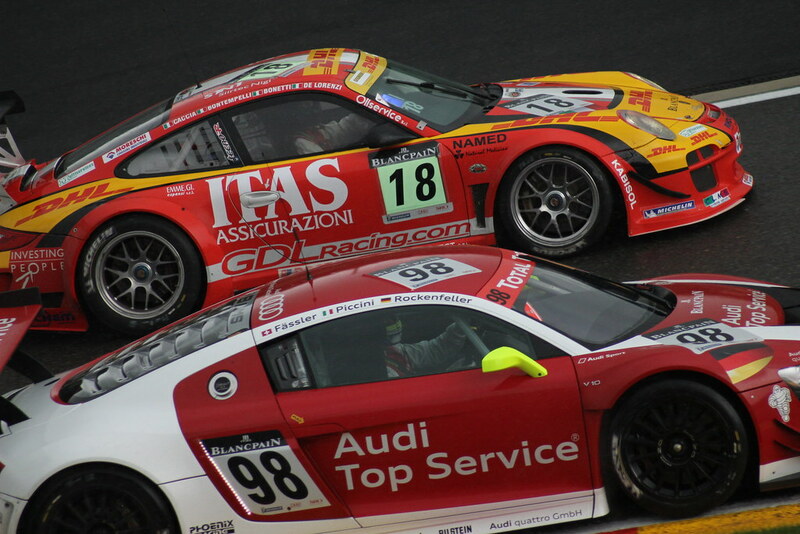 Thankfully, one of the best events of the year was on just that week; the Spa 24 hour race. A race which is GT car based and has been throughout all of its 64 year history (with various intermissions, like WW2). I decided to visit the circuit on the Thursday; training and qualifying day, a perfect day to wander about making pictures. Which is what I did, as the circuit in enclosed by the hills of the Ardennes mountain range changeable weather is to be expected. Which is, exactly what happened; it rained for most of the day. Thank god it did though, it made for spectacular photo opportunities. Cars making their way through gazillions of tiny raindrops at insane speeds and leaving behind huge clouds of spray is always a spectacular sight. Audi R8s, BMW Z4s, Aston Martins, Ferraris, they were all there battling it out among each other, trying to get that pole position (even though it is probably the least important aspect of such a long race). So, off I went of course racing making my way through the german ‘Eiffel’ and through the Ardennes hills to arrive at the circuit at around noon when most of the cars had already done a few practice laps in the morning. Having chosen to first have a look at the ‘Rivage’ corner I had to make my way through the campsite next to the circuit and through some jolly Englishmen setting up camp there (complete with british flag, which for some reason had turned into a german one when I came back..), then making my way through a tunnel next to ‘les combes’. For some reason I appeared to attract a lot of attention with my rucksack and camera bag and had ‘dutch native speaker’ written all over me, such were the stares of our french-speaking wallonian friends, which I always feel are bit of a special bunch.. Which was proven by the fact that they are completely intolerant of anyone with a foreign number plate driving on their roads. They take liberties not seen anywhere else when they notice your nationality and do as if you weren’t there at all. Still, when finally having set-up the camera with my antique Soligor 60-300 M42 zoom lens which weighs a ton, the GT3 cars finally came out to do some more practice laps. You can see the results underneath in our flickr album for this event. After heavy rain, a bit of sunshine and less heavy rain it was time to see the action from a different viewpoint before the formula 3 cars came out. The choice was easy; the corner after ‘Rivage,’ which, if you stand on the hill next to it, gives a wonderful high viewpoint to do some more photography. While I was standing there photographing the cars I could see, in the corner of my eyes, one of the ‘special bunch’ and his Wallonian kiddo making his way past behind me and staying put right next to me on the other side, staring. Not looking at the cars but looking at me and my camera, I wondered: ‘Have I done something wrong? Am I in any way obstructing your view? I’m sorry I don’t speak French and still dare to come here, we are all part of the Schengen area now, you know!’ Before uttering those words, I thought it was best to approach carefully and say: ‘Âllo!’ The Frenchman watched on, still with a grim face, before saying the well-known line: ‘Parlez-vous français?’ To which I of course replied with the immortal line: ‘Je ne parle pas de français, euhh, peut-être, un peu’. Obviously, hearing my dutch accent he replied with: ‘Holland, spreek je nederlands?’ Aha, great so there are wallonians who can speak dutch (only they never do, something to do with language barriers or something..). So in the end it turned out he was interested in my antique lens and was surprised that it could work on a new digital camera. So, no modern incarnation of Marc Dutroux after all then, but just a friendly Belgian who stares and speaks. During a long break with no action on the circuit it was time to head towards the start/finish part of circuit to nose around the paddock and set up shop at the legendary ‘Eau Rouge’ corner to do some more picture snapping. Even though sunset was fast approaching after doing the pit walk and Eau Rouge I didn’t really want to return home yet. Mostly because there was another qualifying session planned, I just had to get some shots of the GT3 (and GT4) cars in the (almost) dark. So, back I went to where I started the day near ‘Rivage’ corner. As this part of the circuit wasn’t lit (and my arm was hurting due to lugging around a 1 kg lens the whole of the day) it was a bit more difficult to make some decent photos, but as the results show underneath some came out well. And what a sight it was seeing all those incredibly bright head lights of all those classy grand tourers. Especially the Audi R8 with its LED light technology was so bright, that it would be no surprise if those driving in front of the Audis would perceive the light as very annoying indeed. Once those lights had also dimmed it was time to call it a day and end an enjoyable day of motorsport. Now enjoy the photographic results..